Cherry City Kitties : Just Do It! I votemfor extra naps all around! 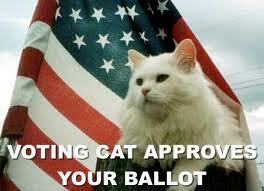 Thank you, Voting Cat! We approve nip for all! Good message, Voting Cat! Our humans will be voting right after work! My human is voting in a little while! You are one lucky puss! It's been brutal this year. We did vote - now the waiting begins. Mom did and she couldn't be happier! Holy Meow! We gots an award! Call me Dexter the Brave!